Delhi had the assembly polls on November 28, 2008. I had been reading in the news papers that all polling booths were now accessible to people with disabilities. By accessibility they meant that the booths now had a step free access and Braille ballot paper. I was happy about the elections because I got a holiday, I was blissfully basking in the sun, till a friend of mine pushed me to go and vote. I tried to get out of it by saying that I did not have a Voters ID card, which he told me was not required and other ID’s were being accepted too. Since I knew the booth will be accessible, I agreed to go. I drove on my electric wheelchair till the booth which was about a kilometer away from my home. It was stationed at a Public School. On reaching I realized that only the wicket gate was open which had a bottom rod over which my electric wheelchair would not go. Then after the gate hurdle the route to the room where I was supposed to cast my vote had two steps. The Delhi Police who were manning the booth were happy to lift me through these hurdles, as they generally had being doing till now. What they failed to realize was that an electric wheelchair with me on it weighed over 200 Kgs. Once I explained this to them they of course were not willing any longer. After a long wait outside the gate a school gardener offered to assist me to get my ballot room. It was like an all terrain ride where I tested my wheelchair driving skills to the limit. Casting a vote that was a simple 5 minutes task for all turned out to be an hour long action packed activity for me, with times where my chair nearly toppled over, while driving over wooden planks that the gardener brought out from the store and spontaneously created temporary slopes for me. The claims of accessibility by the Election Commission are as vague as their understanding of accessibility in the first place. Just for example while it is a positive step that they provided Braille ballot paper for persons with vision impairments, but this was done without their understanding of the fact that a only a small percentage of people with vision impairments can read Braille. They could have considered using large print and colour contrast or even embossing. We talk about Inclusive Education by 2010 and zero rejection policy by schools, then looking at the school where my polling booth was stationed; it seems like a unachievable target. The Government implements schemes and policies such as accessible polling booths, inclusive education, etc without having any analysis of the needs of the intended target group. No wonder they will never be able to evaluate whether having Braille ballots actually helped voters with vision impairments or how to further improve the accessibility of the election procedure for disabled voters. Also while they have 2010 as the magical year by when inclusive education will be a reality, they have no accessibility standards that schools need to comply to. Additionally, the Government’s concept of inclusion is very outdated. 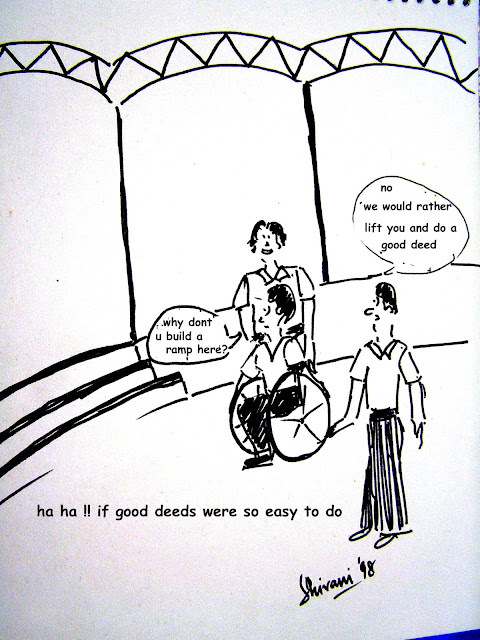 They seek advice on inclusion from un-qualified people working for philanthropy in the disability sector. Disability has to be looked at as a developmental issue rather than a social issue, with appropriate funds and professionalism ingrained into it. After all for building a flyover one will consult an engineer and not a mason, why then when it comes to disability inclusion issues suddenly qualifications and professionalism are not needed and sub standard services provided to the disabled acceptable? The Director General Civil Aviation (DGCA) issued a landmark policy on the ‘Carriage of Persons with Disabilities’ in May this year. This is a landmark initiative not only because neither the Railways nor the Ministry of Shipping, Road Transport and Highways have any such recognition of travelers with Disabilities but also because this Civil Aviation Requirement (CAR) was, for the first time in any government regulations’ history, compiled following inputs from Disabled Peoples Organizations (DPO’s) and extensive public consultation. Though it’s not entirely pro disabled flyers, yet this considerably progressive policy is perceived as a step forward by the Indian government to affirm its commitment to truly embracing the diversity amongst travelers. The famous Rajiv Rajan case of June 2007, that was filed in the Chennai High Court following Air Sahara refusing boarding to Rajiv on the pretext that he was unescorted and did not carry a ’Fit to Fly Certificate’ was discharged from the court on the pretext that the new CAR (Section 3 – Air Transport, Series ‘M’ Part I Sub: - Carriage by Air of Persons with Disability and/ or Persons with Reduced Mobility) has been issued to ensure that any such cases in the future can be rightly addressed. It has been over six months since this CAR was implemented, but if one evaluates the ground reality nothing much has changed and disabled travelers continue to live on the mercy of generally non-compliant airlines and their ill informed customer interaction staff. What does the CAR say? 1. Cannot refuse to carry unescorted persons with disabilities, even if they do not have a disability certificate. 2. People with disabilities are not required to produce any medical certificate nor sign any indemnity forms before flying. 3. Airlines must provide all necessary assistance to a passenger with disabilities who may want to travel alone. 5. The airlines must provide for boarding devices such as ambulifts and aisle chairs. The use of the ambulift is free for passengers with a disability certificate. 7. All airlines need to formulate and publish (including on their website) detailed procedures for the carriage of disabled passengers. Today when it is possible to fly from Delhi to Mumbai in about Rs 4,000/-, people with reduced mobility especially those who are unable to climb the steps leading to the aircraft need to pay about Rs 1,685/- at each airport for the use of an ambulift. This almost doubles the fare for a person with reduced mobility vis-à-vis a non disabled person. Although the DGCA regulation entrusts the responsibility and bills for the required equipment onto the airline, unfortunately this doesn’t necessarily work as promised in a country where manual labor comes cheaper than equipment, and easy for heavy weight airline lobby to flout the law. On an everyday basis the airlines generally prefer to keep disabled travelers in the dark and rather than giving them the choice of an ambulift to board with dignity, they prefer to carry them up stars leading to the aircraft door instead by 4 porters. Not all airlines/crafts have aisle chairs to assist disabled passengers to get to their seat. People with disabilities are carried physically in disrespectful manner to their seats. Since a disabled passenger is last to be boarded out there have been instances where at the night halting station, they have had to wait for over the total flying time for assistance to reach to help them board out of the flight. More often than not a disabled person is expected to continue sitting precariously on a narrow and un-maintained aisle chair till the luggage claming area as the airline staff is just too lazy to get the passenger wheelchair from hold till the door of the aircraft that they are supposed to do. Websites of all Indian operators have far from adequate information available on ‘Carriage of Disabled Passengers’ as required by the CAR. This non provision of information seems a reflection of the ambiguous and unclear policies that the airline towards this. The uncertainty or the non compliance to the ‘Civil Aviation Requirement – Carriage of Disabled Persons’ in the management level permeates down well till the loading staff as none of them is confident about their responsibilities towards a disabled passenger. Go Air - In spite of the CAR denying the requirement of a medical certificate, GoAir requires a ‘Medical Fitness Certificate – ‘Fit to Fly as a Passenger’. IndiGo reserves the right to deny these special services if not requested in advance. Where as the CAR puts the onouce on the airlines for getting adequate information from the passenger at the time of booking, therefore the right to deny services does not apply. Spice Jet and Jetlite have some very scanty information given out of a passenger with special needs. It seems that the airlines purposefully do not provide all information on their site as is required by the recent CAR, as providing information on the website will make their faulty policies and procedures transparent to public scrutiny. If it becomes so then demanding Rs. 1685/- extra from disabled passengers just to be able to board the craft with dignity will no longer be possible. Air travel presently is an extremely stressful activity for a disabled flyer. Passengers with disabilities are always at the mercy of the untrained staff to make their journey a bit better. Disabled passengers pay the same amount as any other passenger but the services provided to them are always substandard as compared to their non co passengers. This has been recognized to be so by the Government hence the issuing of the CAR. In spite of this there has been no improvement on the carriage of a disabled passenger. It is yet another classic example of non implementation of a Government policy. The only way that seem to be left to ensuring improvement is for people with disabilities, knowing about their rights as a flyer and demand to be treated respectfully each time. Finally, unless the Government is able to stand up to the strong air operators lobby, there can be no improvements that a disabled flyer can expect.